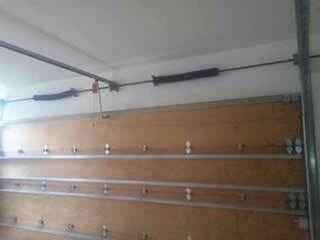 The parts that do most of the heavy lifting when it comes to your garage door system are the springs, and not the opener as a lot of homeowners mistakenly believe. These components provide tension-based force that assists in the raising and lowering of the door panels. Therefore, they are under considerable stress on a daily basis, and when they break they can pose a serious safety risk to anyone standing nearby. Because these springs use tension in order to counterbalance the weight of the door and raise it, they suffer from a lot of wear and tear, and will eventually break after a certain amount of life cycles. When that happens, the springs will snap, which could potentially send them whipping around. If anyone happens to get caught in their path, it could result in a serious accident. The door will also be damaged, as it will likely slam shut as a result. When these components are being installed, or when they're being adjusted, they become loaded with tension, which means the act of simply replacing them can cause them to break if it's not done properly. That's why you should leave the spring replacement job to our skilled technicians, who can complete it not just quickly, but safely as well. In addition to emergency spring replacement services, our team also provides routine maintenance appointments, during which we'll examine these components to make sure their coils haven't become worn or deformed. We'll also lubricate them (torsion springs, not extension units, of course) and make sure they're adjusted correctly and that the door remains balanced. If you find yourself experiencing any type of issue with these components, reach out to our experts at Garage Door Repair Hoffman Estates as soon as possible. We'll make sure your springs are handled with the proper care and caution.